Peter Sydney Ernest Lawford (born Peter Sydney Ernest Aylen; 7 September 1923 – 24 December 1984) was an English-born American actor. He was a member of the "Rat Pack" and brother-in-law to President John F. Kennedy, and more noted in later years for his off-screen activities as a celebrity than for his acting. From the 1940s to the 1960s, he had a strong presence in popular culture and starred in a number of highly acclaimed films. Born in London in 1923, he was the only child of Lieutenant General Sir Sydney Turing Barlow Lawford, KBE (1865-1953) and May Sommerville Bunny (1883-1972). At the time of Peter's birth, however, his mother was married to Dr. Capt. Ernest Vaughn Aylen, one of Sir Sydney's officers, while his father was married to Muriel Williams. At the time, May and Ernest Aylen were living apart. May confessed to Aylen that the child was not his, a revelation that resulted in a double divorce. Sir Sydney and May then wed in September 1924 after their divorces were finalised and when their son was one year old. Lawford's family was connected to the English aristocracy through his uncle Ernest Lawford's wife (a daughter of the 14th Earl of Eglinton) as well as his aunt Ethel Turner Lawford (who married a son of the 1st Baron Avebury). His aunt Jessie Bruce Lawford, another of his father's sisters, was the second wife of the Hon Hartley Williams, senior puisne judge of the Supreme Court of the colony of Victoria, Australia. A relative, through his mother, was Australian artist Rupert Bunny. He spent his early childhood in France, and owing to his family's travels, was never formally educated. Instead he was schooled by governesses and tutors and his education included tennis and ballet lessons. "In the beginning," his mother observed, "he had no homework. When he was older he had Spanish, German and music added to his studies. He read only selected books—English fairy stories, English and French classics; no crime stories. Having studied Peter for so long, I decided he was quite unfitted for any career except art, so I cut Latin, Algebra, high mathematics and substituted dramatics instead." Because of the widely varying national and religious backgrounds of his tutors, Lawford "attended various services in churches, cathedrals, synagogues and for some time was an usher in a Christian Science Sunday School..." Around 1930, aged seven, he made his acting debut in the English film Poor Old Bill. At the age of 14, Lawford severely injured his right arm in an accident when it went through a glass door. The injury greatly compromised the use of his lower arm and hand with irreversible nerve damage, which he later learned to hide. The injury was judged to be serious enough to prevent his entrance into the armed forces, which his parents had planned. Instead, Lawford decided to pursue a career as an actor, a decision that resulted in one of his aunts refusing to leave him her considerable fortune, as originally planned. Prior to the Second World War, Lawford had gained a contract position with Metro-Goldwyn-Mayer studios. Once he signed with MGM, his mother insisted that studio head Louis B. Mayer pay her a salary as her son's personal assistant, which Mayer declined. Lady Lawford responded by claiming her son was "a bummer" and needed to be "supervised". When Lawford learned of his mother's actions, their relationship was reportedly never the same. Lawford's first film role had been at age seven in the film Poor Old Bill. In 1938, he made his Hollywood debut in a minor part in the film Lord Jeff. His first role in a major film production was in A Yank At Eton (1942), where he played a snobbish bully opposite Mickey Rooney. The film was a smash hit, and Lawford's performance was widely praised. Lawford made uncredited appearances as a pilot in Mrs. Miniver (1942) and as a sailor in Sherlock Holmes Faces Death (1943). In June 1943 MGM signed Lawford to a long term contract. His first role under this was The White Cliffs of Dover (1944), in which he played a young soldier during the Second World War. 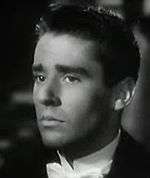 MGM gave him another important role in The Picture of Dorian Gray (1945). 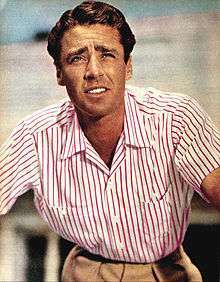 Peter Lawford's first leading role came in Son of Lassie (1945) and he later won a Modern Screen magazine readers' poll as the most popular actor in Hollywood of 1946. His fan mail jumped to thousands of letters a week. With actors such as Clark Gable and James Stewart away at war, Lawford was recognised as the romantic lead on the MGM lot. Lawford's busiest year as an actor was 1946, when two of his films opened within days of each other: Cluny Brown and Two Sisters From Boston. He also made his first comedy that same year: My Brother Talks To Horses (released in 1947). He appeared with Frank Sinatra for the first time in the musical It Happened in Brooklyn (1947). Lawford received rave reviews for his work in the film, while Sinatra's were lukewarm. Lawford later admitted that the most terrifying experience of his career was the first musical number he performed in the musical Good News (1947). Using an American accent for his role, he won acclaim as a performer. He was given supporting roles in MGM films over the next few years, including On an Island with You (1948), Easter Parade (1948), Little Women (1949), Royal Wedding (1951), and You for Me (1952). Lawford's first film after Metro released him and several other players from their contracts was the comedy It Should Happen to You, where he starred alongside Judy Holliday and Jack Lemmon. In 1959, Frank Sinatra invited the Englishman to join the "Rat Pack" and also got him a role in Never So Few. The casino caper Ocean's 11 (1960) was a project Lawford first brought to Sinatra's attention. It became the first film to feature all five main "Rat Pack" members: Lawford, Sinatra, Dean Martin, Sammy Davis Jr., and Joey Bishop. Other films included the acclaimed Israel-set drama Exodus (1960), The Longest Day (1962), a war film with a star-studded cast, and a role as a United States Senator in the political drama Advise & Consent (1962). He reunited with the Rat Pack for a western adventure, Sergeants 3. In 1961, Lawford and his manager Milt Ebbins formed Chrislaw Productions which was named after Peter's son Christopher and produced the 1963 action film, Johnny Cool, starring Henry Silva and Elizabeth Montgomery. He went on to produce the 1965 Patty Duke film, Billie, as well as two films with Sammy Davis, Jr., Salt and Pepper and One More Time. Lawford returned to MGM for They Only Kill Their Masters (1972) which reunited him with several former MGM contract players. His last role was as Montague Chippendale in the comedy Where Is Parsifal? (1983). Lawford made his television debut in 1953 in a guest starring role on Ronald Reagan's anthology series, General Electric Theater. In 1954, he starred as a newspaper advice-to-the-lovelorn columnist named Bill Hastings in the short-lived NBC series Dear Phoebe with Marcia Henderson and Charles Lane. From 1957 to 1959, Lawford co-starred with Phyllis Kirk in The Thin Man, an NBC series from MGM based on the novel by Dashiell Hammett. He had a recurring role on The Doris Day Show from 1971–73, as the love interest to Day's character. He guest starred on various television series including The Doris Day Show The Martha Raye Show, Schlitz Playhouse of Stars, Bob Hope Presents the Chrysler Theatre, Alfred Hitchcock Presents, The Wild Wild West, The Virginian, Bewitched, The Patty Duke Show , The Love Boat, Fantasy Island and The Bob Cummings Show. Besides guest spots, he also guest-starred on variety shows such as The Judy Garland Show and Rowan & Martin's Laugh-In, and game shows What's My Line?, Password and Pyramid. Lawford was romantically linked to various Hollywood women, including Rita Hayworth, Ava Gardner, June Allyson, Dorothy Dandridge, Lucille Ball, Anne Baxter, Judy Garland, Judy Holliday and Lana Turner. In her 2004 autobiography Tis Herself, Maureen O'Hara wrote that Lawford and Richard Boone were arrested in a gay brothel in Melbourne, Australia, while filming Kangaroo. The studio managed to prevent this from being reported by the press. 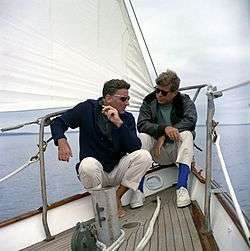 His first marriage, in 1954, was to socialite Patricia Helen Kennedy, sister of then-US Senator John F. Kennedy. They had four children: a son, actor and author Christopher Kennedy Lawford (born 1955), and daughters Sydney Maleia Lawford (born 1956), Victoria Francis Lawford (born 1958) and Robin Elizabeth Lawford (born 1961). Lawford became an American citizen on 23 April 1960. He had prepared for this in time to vote for his brother-in-law in the upcoming presidential election. Lawford, along with other members of the "Rat Pack", helped campaign for Kennedy and the Democratic Party. Sinatra famously dubbed him "Brother-in-Lawford" at this time. Lawford and Patricia Kennedy divorced in February 1966. Lawford was originally cast as Alan A. Dale in the film Robin and the 7 Hoods, but was replaced with Bing Crosby following a break in Sinatra's relationship with Lawford. The break stemmed from a scheduled visit to Sinatra's home by Lawford's brother-in-law, President Kennedy, during a 1963 West Coast trip. Attorney General Robert F. Kennedy, who was long concerned about Sinatra's rumored ties with underworld figures, encouraged the President to change his plans and stay at Crosby's home, which (it was maintained) could provide better security for the President. The change came at the last minute, after Sinatra had made extensive arrangements for the promised and eagerly awaited presidential visit, including the construction of a helipad. Sinatra was furious, believing that Lawford had failed to intercede with the Kennedys on his behalf, and ostracized him from the Rat Pack. Sinatra and Lawford never spoke again, except when Sinatra called Lawford after his son Frank Sinatra Jr was kidnapped on December 8, 1963, and he needed the help of Lawford's brother in law Robert Kennedy, then Attorney General. Sinatra never endorsed another Democratic candidate. Ironically, Crosby, a staunch Republican, ended up cast in Lawford's role. Lawford married his second wife, Mary Rowan, daughter of comedian Dan Rowan, in October 1971 when she was one day shy of 22 years of age; Lawford was 48. Rowan and Lawford separated two years later and divorced in January 1975. In June 1976, at age 52, he married aspiring actress Deborah Gould, 25, whom he had known for only three weeks. Lawford and Gould separated two months after marrying and divorced in 1977. During his separation from Gould, Lawford met 18-year-old Patricia Seaton, who became his fourth and final wife in July 1984, months before his death. Lawford died at Cedars-Sinai Medical Center in Los Angeles on Christmas Eve 1984, aged 61, from cardiac arrest. He had suffered from kidney and liver failure after years of substance abuse. His body was cremated, and his ashes were interred at Westwood Village Memorial Park Cemetery. Owing to a dispute between his widow and the cemetery, Lawford's ashes were removed and scattered into the Pacific Ocean off the coast of California by his widow, Patricia Seaton Lawford, who invited the National Enquirer tabloid to photograph the event. For his contribution to the television industry, Peter Lawford has a star on the Hollywood Walk of Fame located at 6920 Hollywood Blvd. A plaque bearing Lawford's name was erected at Westwood Village Memorial Park. 1953 General Electric Theater John Episode: "Woman's World"
1955 Jane Wyman Presents The Fireside Theatre Stephen Episode: "Stephen and Publius Cyrus"
1955 Alfred Hitchcock Presents Charlie Raymond Episode: "The Long Shot"
1955 Screen Directors Playhouse Tom Macy Episode: "Tom and Jerry"
1956 Playhouse 90 Willis Wayde Episode: "Sincerely, Willis Wade"
1957 Producers' Showcase Lord Brinstead Episode: "Ruggles of Red Gap"
1957 Climax! Tom Welles Episode: "Bait For the Tiger"
1958 The Bob Cummings Show Himself Episode: "Bob Judges a Beauty Pageant"
1959 Goodyear Theatre Major John Marshall Episode: "Point of Impact"
1961 The Jack Benny Program Lord Milbeck Episode: "English Sketch"
1962 Theatre '62 Glen Morley Episode: "The Farmer's Daughter"
1965 The Alfred Hitchcock Hour Ernie Mullett Episode: "Crimson Witness"
1965 Profiles in Courage General Alexander William Doniphan Episode: "General Alexander William Doniphan"
1965 Bob Hope Presents the Chrysler Theatre Lt. Philip Cannon Episode: "March From Camp Tyler"
1966 Run for Your Life Larry Carter Episode: "Carnival Ends at Midnight"
1966 The Wild Wild West Carl Jackson Episode: "The Night of The Returning Dead"
1967 I Spy Hackaby Episode: "Get Thee to a Nunnery"
1971 The Virginian Ben Hunter Episode: "The Town Killer"
1972 Bewitched Harrison Woolcott Episode: "Serena's Richcraft"
1978 Hawaii Five-O Kenneth Kirk Episode: "Frozen Assets"
1979 The Love Boat Teddy Smith Episode: "Murder on the High Seas/Sounds of Silence/Cyrano de Bricker"
1979 Supertrain Quentin Fuller Episode: "A Very Formal Heist"
1981 Jeffersons, TheThe Jeffersons Museum Guide (Voice) Episode: "The House That George Built"
↑ Obituary Variety, December 26, 1984. ↑ DRAMA: Alice Faye to Return in 'Frisco' Feature 'Hattie' Work Resumed Glider Yarn Announced Three Holt Films Set Texas 'Find' Gets Role Rowe to Screen-Debut Schallert, Edwin. Los Angeles Times (1923-Current File) [Los Angeles, Calif] 07 Apr 1942: A8. 1 2 3 4 5 6 7 8 "IMDB entry for Peter Lawford". ↑ Universal to Make 'Chamber of Horrors' -- Bogart Ban Lifted -- 4 New Films This Week Special to THE NEW YORK TIMES.. New York Times (1923-Current file) [New York, N.Y] 07 June 1943: 9. ↑ "Radio's Golden Age". Nostalgia Digest. 39 (2): 40–41. Spring 2013. ↑ Kirby, Walter (November 22, 1953). "Better Radio Programs for the Week". The Decatur Daily Review. p. 46. Retrieved July 8, 2015 – via Newspapers.com. Lawford, May; Galon, Buddy (1986). The Autobiography of Lady Lawford As Told to Buddy Galon. Brookline, Mass. : Branden Publishing Co. ISBN 0-8283-1995-2. Wikimedia Commons has media related to Peter Lawford.